Nick's Stamps- Obama's: Muslim Stamp Controversy. Lately we have been receiving many emails and phone calls regarding an old topic. There is much confusion surrounding this issue. The questions are related to the issuance of a stamp commemorating the Eid Muslim holiday season and it is generally assumed that President Obama demanded that it be issued. To set the record straight, there has already been a stamp or two issued commemorating this holiday. In 2001 the US Postal Service issued a “Postal Services Holiday Celebration” series commemorating the holidays Christmas, Chanukah, Kwanzaa, Cinco de Mayo and both Muslim holidays Eid al-Fitr and Eid al-Adah . These stamps were issued on Sept 1, 2001 while Obama was just a state senator in Illinois. “This is a proud moment for the Postal Service, the Muslim community and Americans in general as we issue a postage stamp to honor and commemorate two important Islamic celebrations,” Azeezaly S. Jaffer, vice president of public affairs and communications for the Postal Service said in the 2001 press release. The stamp was reissued 6 times over a 10 year period. The first time it was reissued was the following year 2002 when the Bush Administration wanted to reach out to the Muslim community and honor of Ramadan. The last time the stamp was issued was on Sept 3, 2010. 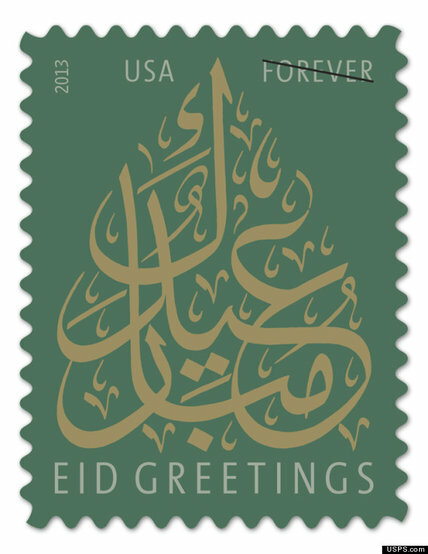 However last year the post office did issue a new Eid stamp commemorating the end of the holy month holiday of Ramadan. As stated in one of our previous articles, there will always be some sort of protest or controversy with what the post office wishes to honor on their stamps. But, before protesting make sure you do your due diligence and at least get accurate historical data to support your argument. Stamps have a long history that predates most of our protests and arguments. So, if you’re ever in doubt and need a fact check flip through an old Scott album or call up your local stamp enthusiast. We’re happy to help! For other stories about postage stamp controversies please visit our Philatelic Topic’s page. Nick’s Stamps was established in 2002 and is located in San Diego California. I found my first stamp collection 13 years ago at a Salvation Army in San Diego and I was hooked from day one! I began to amass more collections and spent a few years researching the stamp market.I started advertising and making offers on stamp collections. I am very surprised to know about US postal department’s such efforts to honor Muslim festivals! Even postal dept. Of Bangladesh never thought of this! We also need stamps on hindu holy days. Hindus are a not so insignificant part of American milieu now. I make this request to the ONLY HINDI seanator in USA. Thanks for publishing this information. When I saw the entry on google, I expected to find some right-wing screed “proving” that the President is not an American, not a Christian, not one of us, blah blah blah. How refreshing to find a simple statement of fact. I shouldn’t have been surprised: Philatelists tend to be factualists.